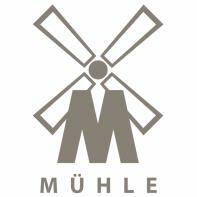 The PURIST range by Muhle focuses on simplicity and style. This shaving set includes a Synthetic Fibre Brush, Muhle Safety Razor and Chrome Stand. The wood is handpicked and turned from square blanks of Karelian Masur Birch. Only the finest pieces of wood are waterproofed and turned into handles. The brush has a knot of synthetic hair which is super-soft on the face, yet has sufficient backbone for lathering both hard soaps and soft creams. The design of the Purist stand is typical Muhle – classic, fuss-free lines and a flawless chrome plated finish. Most shaving brushes and safety razors are compatible with this stand. The U shape gap for the brush measures 28mm at its widest point. The U shape gap for the razor measures 12mm at its widest point. Place some cream or soap into a lathering bowl along with a few drops of warm water and use the brush to whisk up a rich creamy lather. When you have finished, hang your brush and razor on the stand and let them aerate well before your next shave.